Calefax is a close-knit ensemble of five reed players united by a shared passion. For more than three decades they have been acclaimed in the Netherlands and abroad for their virtuosic playing, brilliant arrangements and innovative stage presentation. Musicians History The name Calefax? Calefax often joins forces with other musicians and artists from other disciplines. A hallmark of these collaborations is the continual quest to present striking, new repertoire and an adventurous approach to stage presentation. They have collaborated with the pianists Jean-Yves Thibaudet, Ivo Janssen, Louis van Dijk and Michiel Braam, violinists Liza Ferschtman and Claude Chalhoub, cellist Matthew Barley, singers Lenneke Ruiten, Christianne Stotijn, Helena Rasker, Nora Fischer, Cora Burggraaf and Denise Jannah, trombonist Christian Lindberg, the Tony Overwater Trio, Cappella Amsterdam, Danel Quartet, the Nederlands Kamerkoor, trumpeter Eric Vloeimans, clarinettist Kinan Azmeh, choreographers Boukje Schweigman and Sanne van der Put and visual artists Jaap Drupsteen and Wouter van Reek. Calefax also performed for the soundtrack of the 2013 Dutch film De nieuwe wildernis. Calefax has released 18 CDs under the renowned label PENTATONE, the German MDG label and its own RIOJA Records label. All the recordings have earned critical acclaim from the international press. Calefax’s cd Romantic Kaleidoscope, was released in October 2015, packaged within the anniversary book Calefax en de Caleidoscoop, written by the radio presenter Lex Bohlmeijer and published by Cossee. The mezzo-soprano Cora Burggraaf can be heard on the CD entitled The Roaring Twenties, while the On the Spot CD features the trumpeter Eric Vloeimans, who transports Calefax into the world of jazz and improvisation. The Dutch newspapers De Telegraaf and De Volkskrant awarded Calefax five stars for their celebrated 2013 recording of the Goldberg Variations. 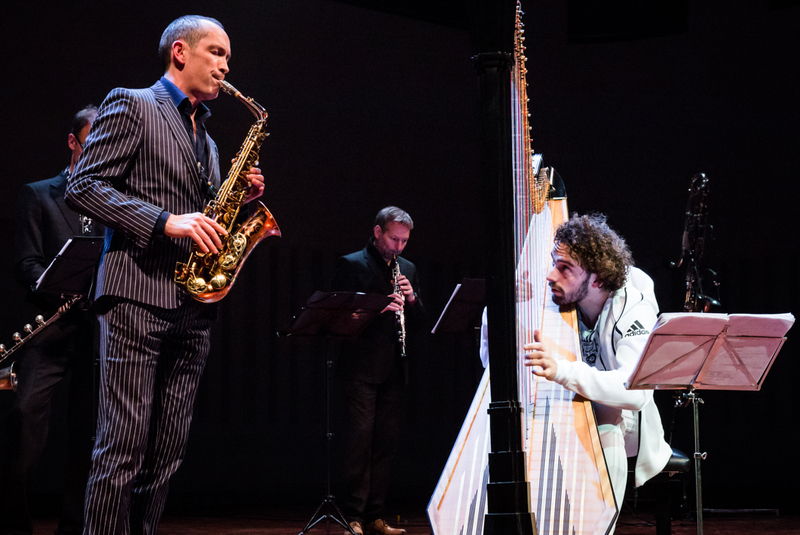 Calefax has won many major Dutch music prizes, including the 1997 Philip Morris Arts Prize, the 2001 Kersjes van de Groenekan Prize and the 2005 VSCD Classical Music Award. In 2012 Calefax received the German Junge Ohren Prize for the family musical show The Music Factory, a co-production with the Dutch theatre company Oorkaan. Calefax regularly tours abroad. The group has given concerts in virtually every country in Europe, as well as touring Russia, China, India, Turkey, Japan, South Africa, Brazil and the United States, performing at major venues including Wigmore Hall (London), the Oriental Arts Centre (Shanghai) and Lincoln Center (NYC). In January 2013 Calefax had the honour of accompanying the former Dutch Queen Beatrix on her final two state visits, to Brunei and Singapore.